An all star cast of Country superstars will be appearing on a new singer-songwriter series called “Legends & Lyrics,” airing Saturday, July 4 at 10 p.m. on local Nashville public television channel WNPT. The program, which debuted on May 9, pairs legendary songwriters and performers with promising new talent in an “in-the-round” writer’s format that features performances and interviews with the artists. Daniels recently returned from his third international trip to visit military troops in Iraq and Kuwait and is currently touring the U.S. through the end of 2009. The first season of “Legends & Lyrics” features acts including Kris Kristofferson, Kenny Loggins, Patty Griffin, Shawn Colvin and John Hiatt, as well as rising artists The Laws, Stephanie Chapman, Corinne Chapman, Jonathan Singleton, Nathan Lee, Mike Musick, Will Hoge and more. Each episode will also include a one-on-one conversation with a featured guest, such Garth Brooks, Loretta Lynn, Ray Stevens, Steve Cropper, Cowboy Jack Clement and others. 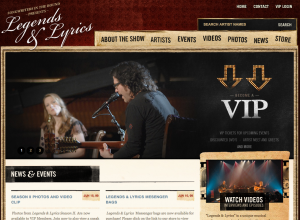 “Legends & Lyrics” is produced by Nashville-based production company Song-Writers In The Round, LLC. Season one episodes were filmed on location in 1080 high-definition in Nashville, Tenn. at the Masonic Lodge and Shreveport, La. at the Scottish Rite Theatre. Dolly Parton Goes Platinum in the U.K.